Pebble, I enjoy your analysis, but are you really saying you bought at the low on Friday and you sold at the exact high yesterday? DeMark 15 min is saying we will have a bottom shortly in the SPX. Remember, our target is 1288-1323, although 1288 has been fudged to 1295 simply because a dip below 1292 would be problematic for the bulls from a wave count perspective; i.e., I think they’ll pull out all the stops to avoid it. 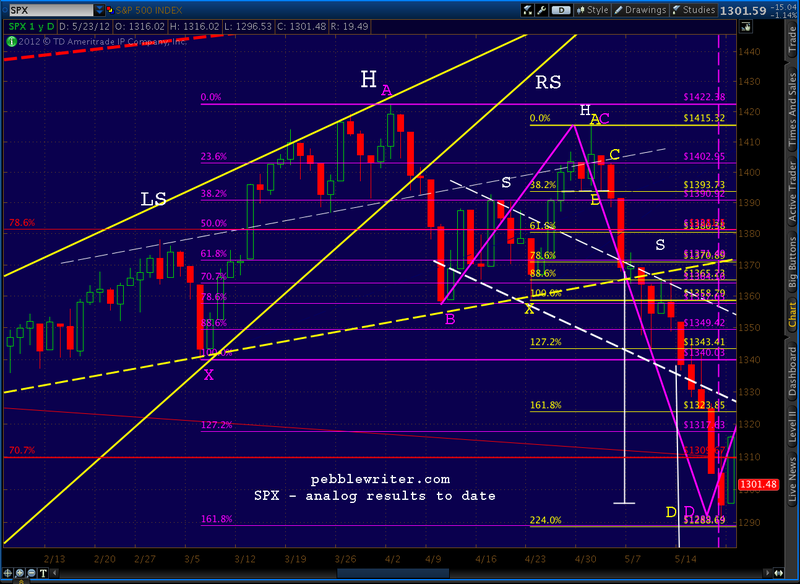 In between, the market hit my upside target of 1415 on the nose, and just about every interim target on the way down. We arrived at 1295 only two days later than my forecast from six weeks earlier (the purple line below.) So, trust me when I say I was fairly confident going into last Friday's session. We were completing a Butterfly pattern at 1289.14, a Crab pattern at 1288.69 and were approaching a Head & Shoulders target of 1289. And, a number of other indicators I watch were all screaming "here comes a bottom." I really, really expected a bounce. Was I nervous? Enormously. In my nervousness, I devoted practically an entire post [see: Message in a Bottle] to the fact that I'd written myself a note in an April 12 post [see: Analog Details] to bolster my confidence in what I knew would be a very nervous moment a month later. But, it worked out. As to 1328, that was much easier. 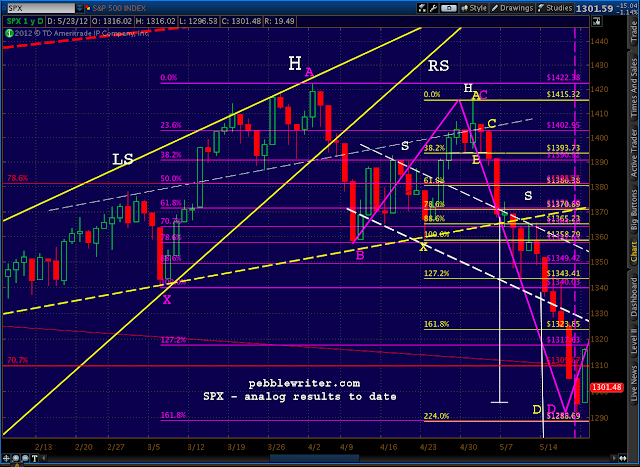 As I wrote yesterday morning [see: On Track] my 1330 target was based on the previous H&S neckline. But, I was also watching the Fib levels (red Fib lines above) and RSI activity -- which was flashing overbought from the word go. Within the next 15 minutes or so, that trend line was broken, and back-tested (the yellow arrow.) That was all I needed to confirm a good entry point; so, I went short -- with stops a little over 1330 just in case. And, it worked out pretty well -- except that I got cocky and traded at the end of the day yesterday when SPX very nearly hit my 1309 target (it was my birthday and I was loopy on my wife's incredible pineapple upside-down cake.) Had I looked at the 5-min chart again, I would have waited. So, I got stopped out this morning at around 1305 and sat out until 1296-1298 (discussed at 10:40AM, occurred at 12:25PM) which so far is looking like the right move. Note the back test of the channel -- setting up more positive divergence. I have stops in just below 1292 just in case, and still believe we're in for lots of chop. With respect to DeMark, I know a lot of folks who follow him, and it seems we're often of the same opinion. But, I've never studied his methodology and don't really keep track of his forecasts. I do take some comfort -- especially when taking a contrarian view -- when smart people express concurring opinions. I sat watching my daughter play volleyball all weekend and ran into another dad who's very smart and also in the investment management biz. He asked how I'd done in the markets lately, and I started to tell him about catching the rise to 1422, the decline to 1357, the rise to 1415, and the decline to 1292. As I talked on, I could see the word "bull****" forming on his lips. I stopped talking and went back to watching volleyball. If this is the sort of analysis that might be helpful to your investing success, head on over to pebblewriter.com and sign up today. Introductory prices expire tomorrow, May 24 at midnight PST.